There are a few problems in life that are really nice to have. Lately we've been wrestling with a problem of just that variety. Chicago is overrun with fantastic places to eat. Trying to narrow down the field and choose where to spend a special evening, can be a chore. It certainly isn't a chore that you'll ever hear me complain about, but is a chore. 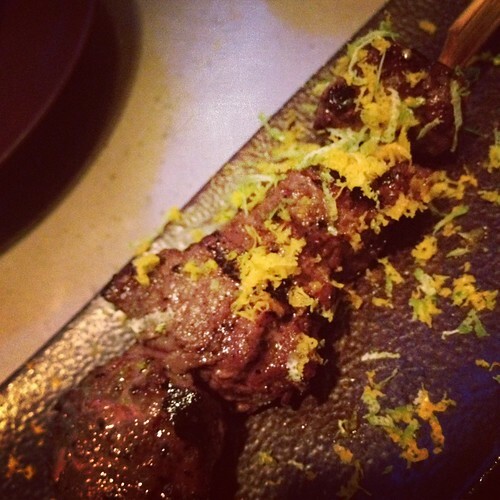 Although we arrived a few minutes before our reservation, we were seated immediately and offered our choice between a table by a window, seats at the sushi bar or a place at the grill. Opting for a table, we were shown to our seats and served complimentary edamame to snack on as we made our decision. 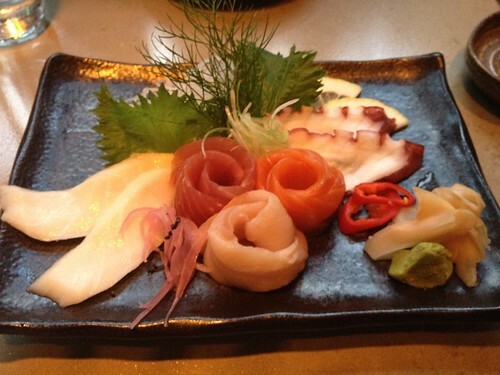 As huge edamame fans we made quick work of it while we decided to play it safe with the Chef's sashimi selection. Despite a moderately full dining room, we were served very quickly. My favorite on the platter was the white tuna. It was fatty and flavorful and left me excited for what was still to come. Next up we had the Black Rice Sushi sampler. This was a great way to enjoy a few old favorites (Spicy tuna and Dragon Rolls) and try some new rolls (Hokkaido and Devon Rolls) too. 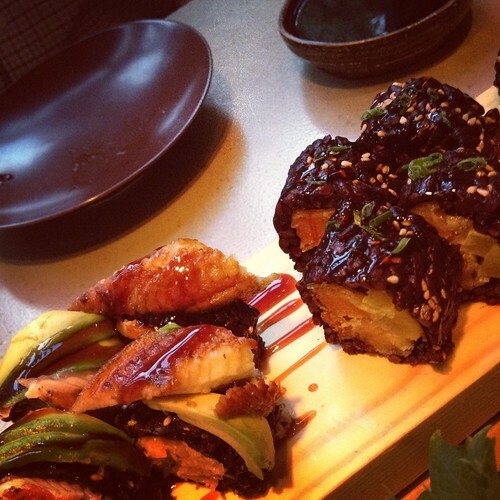 The sampler consists of four half rolls made with black rice. Having never had black rice before, I was excited to learn that in addition to being delicious, it has fewer carbs and calories than traditional white rice. I liked the texture of the black rice and flavor-wise it didn't pull my attention from the real stars of the show, the fish and vegetables it contained. The surprise of the evening was how much I enjoyed the Devon roll. The Devon roll contains tempura sweet potato, curry mayo, chive, pickled radish and eel sauce. For me, sushi without fish is usually a waste of my time, but the crunch of the tempura and pickled radish made this roll a stand out. Because I'm on a mission to try 25 foods that might make other people gag, next we ordered a kangaroo kabob. I'll start with the good. The meat seemed to be prepared properly as it was juicy and tender. But there was something off about its flavor. We couldn't really put our finger on why it was wrong. It was just wrong. It was gamy, but not pleasantly so. It unfortunately, left an unpleasant aftertaste too. No amount of orange and lime zest were going to counteract it, though the chef tried. As I was chewing, all I could think was that it was funky - and I'm not talking about George Clinton style funk. We finished off our meal on a much higher note. Last up we ordered the Tsukiji roll. This roll was as beautiful as it was delicious. 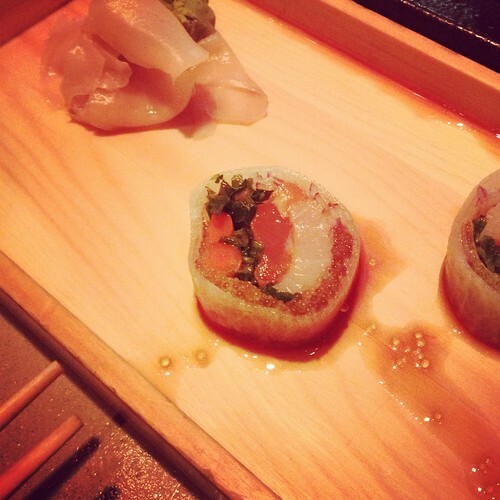 The cilantro and radish wrap gave the roll a fantastic freshness. The wasabi tobiko delivered my very favorite sushi experience - pop, pop, pop. Oh how I love the pop of roe. Not only was our food first class, the service was stellar. Our waiter was attentive, honest and funny. Our water glasses were constantly attended to and the manager stopped by to greet us and describe in further detail the black rice sushi sampler. I loved the urban decor and kept turning in my chair (I chose the window view when we were seated) so that I could enjoy the graffiti wall and enormous silver sculpture in the center of the restaurant. Is it a flame? Is it a flower? Either way it's intriguing. As we finished our meal we realized we'd come across yet another wonderful problem to have. In a city filled with fantastic places to eat, when you find a restaurant you know is a winner, do you return to it repeatedly or keep trying out new ones? How do you handle this problem?Are you a restaurant regular or are you constantly on the look out for something new? I owe a special thank you to Laura from deux chicago for suggesting both Union Sushi + Barbeque and the Tsukiji Market Roll. You were so right! I'll take your restaurant recommendations any time.